The first fully automatic NERF Clip System blaster to date, the N-STRIKE STAMPEDE ECS blaster features a new pop-out bipod, which doubles as a handle, and a removable shield allowing players to transition to Attack Mode. The NERF N-STRIKE STAMPEDE ECS blaster also comes complete with one six dart Clip and three extended Clips which hold 18 darts each, offering the highest Clip capacity from NERF yet. The NERF N-STRIKE ECS blaster is one of the most awesome and exciting N-STRIKE developments released in over 40 years of NERF brand history. Includes 60 Clip System darts. Requires six “D” batteries; not included. Aspiring vigilantes aged eight years and up will be totally equipped to fight bad guys with the Nerf N-Strike Stampede ECS. 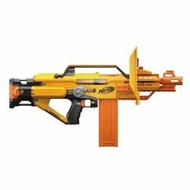 This fully automatic blaster unleashes a storm of soft Nerf darts from the extended 18-dart clip–and it is easy to reload with the spares. The high-capacity Stampede even includes a blast shield to deflect incoming “fire,” as well as a pop-out bipod for stability. With the Nerf N-Strike Stampede, a fired-up adventure is just around the corner. The fully automated Nerf N-Strike Stampede ECS has the ability to launch an astounding three darts per second. Your child can either squeeze the trigger once to let a single dart fly, or hold the trigger down and have the Stampede launch Nerf darts in rapid-fire succession. With three extended 18-dart clips, a quick-reload 6-dart clip, and 60 Clip System darts, the Stampede is ready to reload and keep the foam flying. The Stampede’s accessories can be configured for all kinds of action adventures. Kids can bunker down for an ambush with the pop-out bipod. Simply snap on the bipod to support the barrel, hold the target in the pin sight, then take a shot. The Stampede boasts a 30-foot firing range, so the backyard or basement can be covered in soft Nerf darts in no time. When the battle heats up, the Stampede’s blast shield attaches quickly to fend off return “fire”.